Actor Steve Carell yells a line from one of his movies onstage during MTV's "Total Request Live" June 18, 2007 in New York. Carell stars in "Evan Almighty." If you're adapting the TV classic "Get Smart," it doesn't take a leap of faith to cast Steve Carell in the starring role. Tracy asked the comedian what it's like to be an action hero. "Well, there were times when I thought, 'What am I doing? How did this come to pass? How did I go from say, playing Brick Tamlin in 'Anchorman' to the guy hanging off of an airplane?'" "That's what they call 'range' in your business," Tracy said. "No, this would be called 'luck,'" Carrell said. "I just all lucked out with this whole thing." He plays Maxwell Smart, the secret agent who isn't. 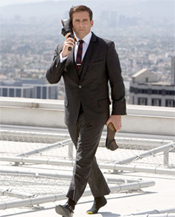 Carell says "Get Smart" was the first time he did not have to audition for a role. "That was mind boggling. And I said 'yes' immediately. I was a huge fan of the original." "Get Smart" was a TV hit in the late '60s, spoofing the secret agent genre. It starred Don Adams as Max, Barbara Feldon as Agent 99, and Edward Platt as the Chief. "The most important thing I think with any sort of remake if you will is that you have to have an affection for the source material. And we all had that. We all cared a great deal about the original 'Get Smart.'" This time around, the chief is played by Alan Arkin, who admits he used a stunt double when he got bonked on the head with a fire extinguisher. "I use a stunt double these days when I have to walk across the room," Arkin said. Carrell says Arkin is his idol. "He's one of those guys that completely lives up to your expectations, exceeds them." Carell, who co-starred with Arkin in the sleeper hit "Little Miss Sunshine," said of the Oscar-winner, "He's just such a good actor. It's hard not to be a little intimidated around him." "If it's true I might like to see a little more homage when he's with me, a little bowing and scraping," Arkin said. "I don't get any of that. Carell may moonlight on movies, but he's kept his day job at "The Office," the NBC comedy. Carell won a Golden Globe for his role as Michael Scott, the socially-inept office boss. But he's never actually worked in an office: "I've waited tables, I've worked for the U.S. Postal Service, I worked in the produce department of a supermarket, but I have never worked in an office." In fact, Carrel planned to be a lawyer, but his parents told him to follow his heart. So he moved to Chicago and joined the famed comedy troupe Second City. "It was just so much fun," Carell said. "And you just felt you were fooling around and playing and getting paid for it. That was like a fantasy job." At Second City, he met his future wife, Nancy, and another future comedy star, Stephen Colbert. Colbert helped him land a job as a correspondent on "The Daily Show," covering the 2000 Election. After several supporting film roles, Carell pitched his own movie idea to filmmaker Judd Apatow. "I pitched it and he had this look on his face. And he said, 'I could sell that movie today. I could get on the phone and I could call someone and we could sell it.'" He did, and together they co-wrote "The 40-Year-Old Virgin," with Apatow the director and Carell the title character who truly suffered for his art. He said the chest-waxing "looked horrendously painful, it was really. The women who worked on the crew, they all told me, 'Maybe you should take some ibuprofen.'" His star dimmed briefly last year when he took on the lead role in "Evan Almighty," the most expensive comedy ever made. It was a disappointment at the box office. "You can't really take it personally because it's just, you know, it's just a movie. You do your best. You try it. If people like it, fantastic. If people don't, well, you try to do something different next time, you know?" His movies, his "Office" job, even a recent stint hosting "Saturday Night Live," had one of his fans at an MTV Q&A wondering, "When do you find time to sleep?" His answer? "It seems like it's non-stop work but it's really not. It's pretty easy. And really fun and they pay you way too much." Carell is also earning a reputation in Hollywood as a nice guy. Something his "Get Smart" co-star Anne Hathaway vouches for. "Steve Carell is just the most wonderful, squishy, muffiny, pumpkin, rock star, amazing person you'll ever meet," she said. "There's no ego there. It's just a sincere appreciation for what he has and that's really rare." Is the reason for his handling fame well because it has come later in life? "I think to a degree, yeah," he said. "You never know how you would've reacted based on another time of your life. But chances are I could've been a huge jerk if it had happened earlier, because you're less mature and you don't have your priorities as set in your mind." Carell doesn't know if his success will last. But that doesn't stop him from enjoying it … to the max. "I'm so happy about it, excited, trying to enjoy it," he said. "But I don't worry about losing it, you know, because I've had plenty of success."